'One Particular Harbour' is an ideal vacation getaway for couples, families or small groups. 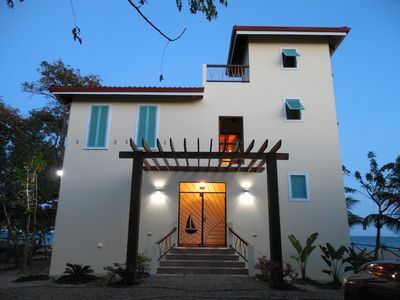 This villa is located among a stretch of private beach homes in the quiet Plantation area on the Placencia peninsula. The home is composed of three suites. 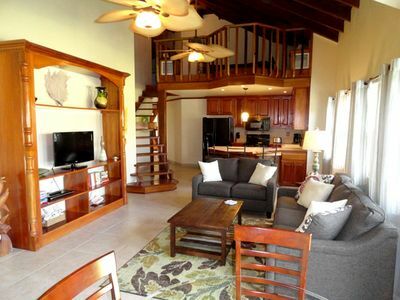 The upper level living area is the 'Cheeseburger in Paradise' suite. 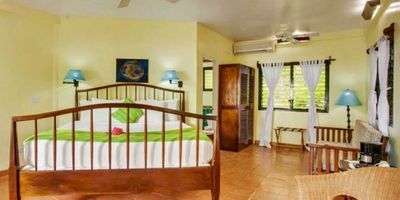 It is composed of a master bedroom, full gourmet kitchen, living room, private bath with an open shower and two sinks. 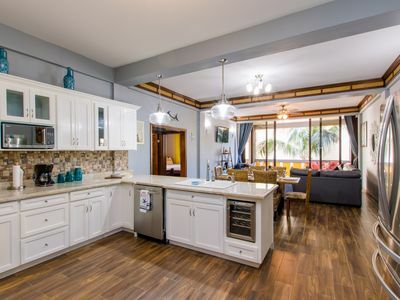 Vaulted mahogany ceilings and hardwood floors provide beauty and comfort. A covered 400 sq. 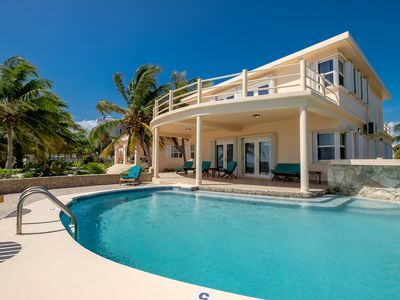 ft. veranda runs the length of the home and provides views of the ocean from the deck and inside of the home.The living room has a comfortable convertible double sleeper couch. 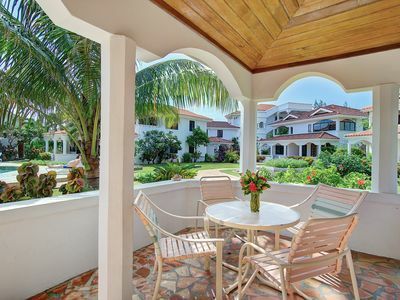 Enjoy your breakfast on the porch watching the sunrise as the sea breeze gently cools you. The house is designed to allow the ocean breeze access to the entire house as the outside living space blends with interior living area. There are individual AC units in the bedroom and living area to cool the unit for your comfort. Ceiling fans throughout the home keep the air fresh. 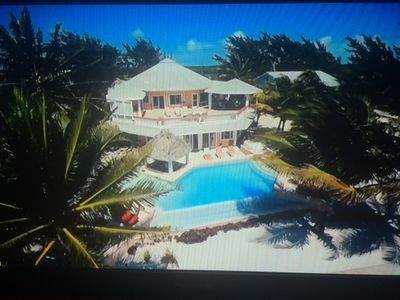 Each has a queen bed and en-suite bathroom, and have double doors that lead directly onto the deck, pool and beach. The spaces share a smaller kitchen between the two bedrooms, a convenient way to store the poolside drinks without having to venture upstairs. Each unit is individually air conditioned. The ground floor units open onto a 800 sq. 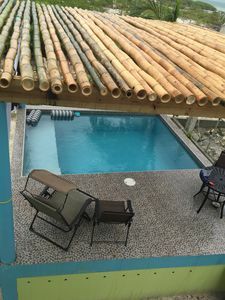 ft. covered veranda with pool. The swimming pool is perfect size to keep you cool while you enjoy the view of the ocean. 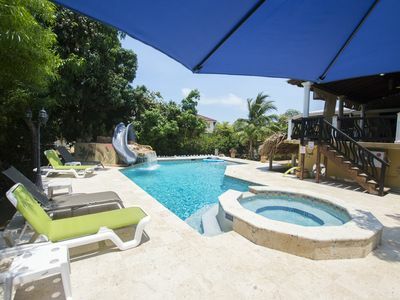 Enjoy the decks and pool veranda to swim or sunbathe. There is a variety of patio furniture, a huge hammock, and a gas barbecue here. 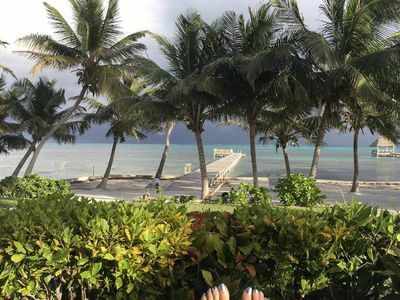 You only have to venture a few steps in the white sand to your own private beach complete with chairs, hammock and covered palapa. 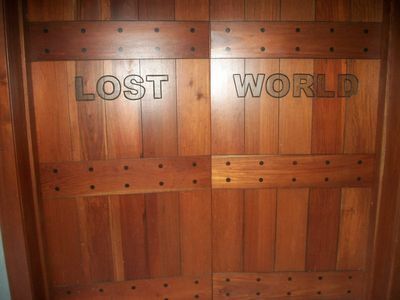 Finally there is a third floor - an observation deck which allows views of the ocean, the lagoon, and the Mayan mountains. This spot is perfect for breakfast coffee and an evening 'sundowner'. The observation deck provides truly breath taking views. The property caretaker lives across the street. 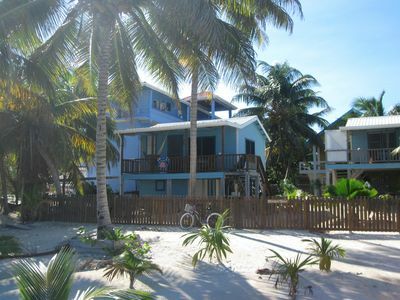 The home is unique in that it has Caribbean beachfront as well as shorefront on the scenic Placencia lagoon. This offers diverse recreational options including kayaking and fishing. Two double kayaks are provided with the house, together with lifejackets. 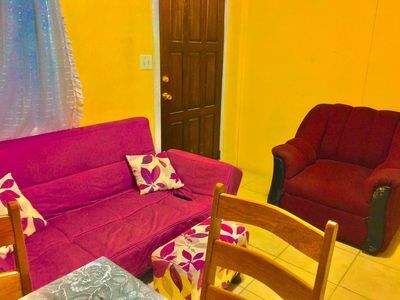 The villa is 10 minutes to the village of Maya Beach, where there is a good selection of bars and restaurants and the nearest grocery store. 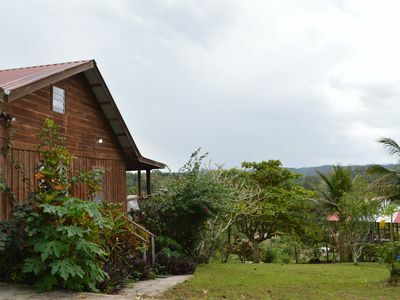 It is a further 15 minutes to the village of Placencia. 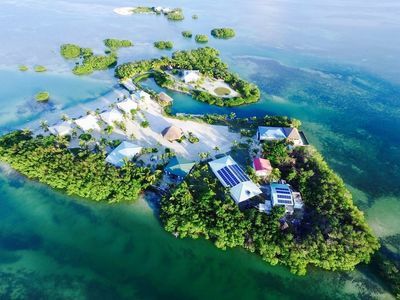 There are many tour opportunities in the Placencia area; SCUBA, snorkeling, jungle river trips and fly fishing just to name a few. The fishing is world class and makes Placencia home to many well known international fishing outfitters. 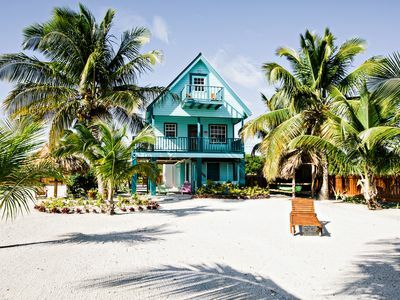 The diving make this a favorite destination for SCUBA enthusiasts. The offshore reef is the second largest in the world and is a thrill to both novice and seasoned divers. 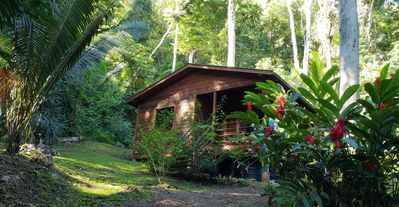 There is easy access to the Hummingbird highway leading north to the mountains and many famous rain forest lodges. There are also a number of day spas on the peninsula. 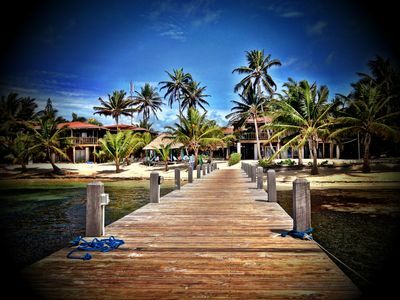 You may just elect to stay home, walk the beach, swing in a hammock, read and enjoy being in beautiful Belize. 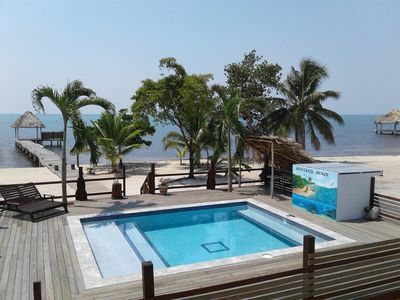 Retreat to Belize in Your Own Private 12 Room Resort !! 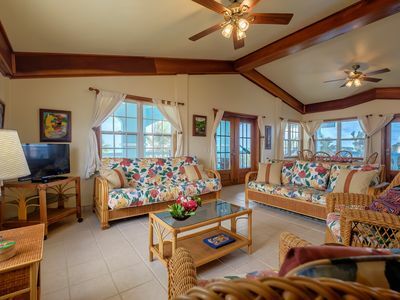 Beachfront Luxury Condo - Paradise Found! 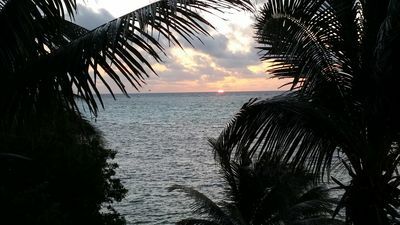 Caribbean Shores b&b cozy and affordable! Two Bedroom Home with Pool and Pier!